When it came to reading comics as a kid, I was never a traditionalist. I didn’t go for the obvious choices like Spider-Man or even Batman. Instead, I went for Doctor Strange, the Falcon, and of course, the Black Panther. In some people’s eyes, these were the lesser-known heroes. To me, these guys were Gods! T’Challa was a King, Stephen Strange was a doctor, and Sam Wilson….well, umm…he had a bird! I got into “Black Panther” in 1998 after I saw “Blade” and heard Wesley Snipes wanted to play the King of Wakanda in his next film. Thank God that never came to fruition, because if it did, we wouldn’t have gotten this week’s film “Black Panther.” Let’s find out if it’s any good shall we? Oh who am I kidding... it's great! “Black Panther” picks up a week after the events of “Captain America: Civil War.” King T’Chaka (John Kani) is dead and Prince T’Challa (Chadwick Boseman) is about to become the new ruler of Wakanda. Not only is T’Challa going to be King, but he will also take up the mantle of the Black Panther; the sworn protector of the Wakandans. The celebration is short-lived however when a mysterious man name Killmonger (Michael B. Jordan) comes to Wakanda to claim his birthright. 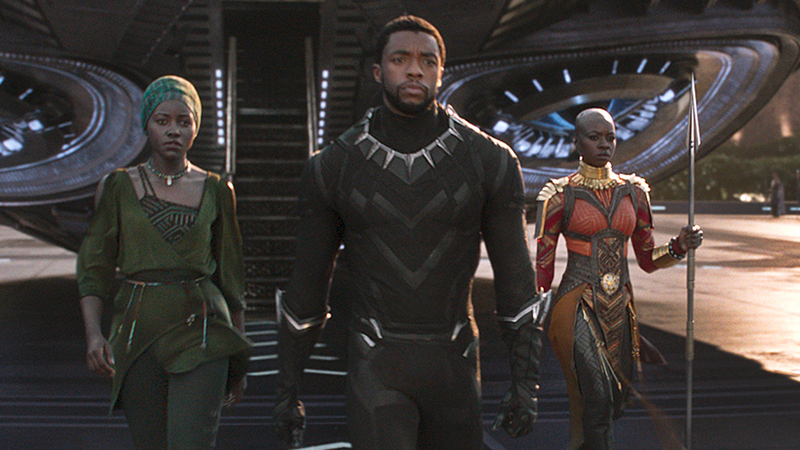 Aided by his tech-savvy sister Shuri (Letitia Wright), ex-girlfriend Nakia (Lupita Nyong’o), and CIA agent Everett Ross (Martin Freeman), T’Challa will guard his kingdom as the mighty Black Panther. I loved this movie! It is easily Marvel’s opus and serves as a crowning achievement in storytelling. They really cracked the formula with Black Panther. They allowed Ryan Coogler to do what he does best. Marvel's head honcho Kevin Feige told Coogler that “Black Panther” is the best film they ever made, and he’s not wrong. Coogler is an independent filmmaker. He made the brilliant “Fruitvale Station” and the Rocky reboot “Creed.” What’s truly amazing is that Black Panther has the same amount of emotional urgency as those two previously mentioned films. You don’t normally see that Oscar-worthy style of film-making in a big budget superhero movie. Coogler places a powerful message about leadership at the forefront of this film; one that begs the question "Are we leading our lives in a direction that would make future generations proud?" This question is especially significant in this day and age. Coogler leaves that answer ambiguous. What remains clear is that“Black Panther” is a great film. There’s so many reasons to like or even love this movie. First, the positive female role models will make you say: "Wow! Marvel at last upstaged 'Wonder Woman'" in terms of female empowerment. There’s at least four positive female role models for young women and an entire army of female bodyguards. Nyong’o and Gurira prove that Hollywood needs more strong, independent women pushing a male lead forward. Letitia Wright as Shuri is the breakout star for this critic. Every scene she was in she stole from Boseman, who was his usual charming self. Boseman has the intensity of Denzel Washington and the charm of Will Smith. He’s an incredible actor who excels at internalizing his character's turmoil. I stand by my earlier statement, thank God Wesley Snipes backed out of this film in the early 2000's. Only Boseman can play the protector of Wakanda. “Black Panther” joins “Doctor Strange” and “Thor Ragnorak” in my MCU top five. The cinematography is gorgeous, Ludwig Göransson’s score is incredible, and I believe Michael B. Jordan as Erik Killmonger is the best villain the MCU has ever had! Never has an MCU villain been so fleshed out with a backstory as raw as the hero’s. Jordan is the only actor who could convincingly go toe-to-toe with Boseman and make you empathize with him. “Black Panther” is a perfect film and not just as a film in the MCU. You could easily take out the superhero element and still have a wonderful film about a country split down the middle. This is a must see film!